Nukes – How do we deal with North Korea, Iran, Russia, and Trump? Remember 2015 when the big nuclear weapons news was the deal negotiated by the Obama administration with Iran? Why is the UN now voicing fears of catastrophe? What role is the new Trump administration playing in the escalation of provocation? Are the UN’s fears real and if so, what can we do about it? JOE CIRINCIONE is President of the Ploughshares Fund which supports people and organizations working to reduce and eventually eliminate the dangers posed by nuclear weapons. COUNTDOWN TO ZERO, playing in NY and DC opening in LA July 30th. How big a threat is North Korea? Will Iran go nuclear? Will Israel attack Iran? Are nukes safe in Pakistan? Are they safe in the former Soviet Union? Will Obama move seriously toward disarmament? The globalization of the 21st century has produced positive and peaceful exchanges between peoples and nations, and it has given birth to global terrorism. Today a nuclear attack caused by accident, miscalculation or madness is a real possibility. 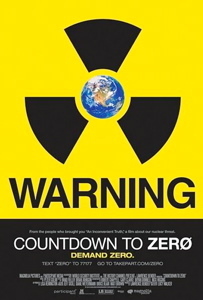 The film COUNTDOWN TO ZERO (playing in NY and Washington and opening July 30th in LA) makes clear the nuclear threat and calls on us to commit to their abolition. COUNTDOWN TO ZERO traces the history of the atomic bomb from its origins to the present, where nine nations possess nuclear weapons capabilities, and others race to join them. The world lives in a delicate balance that could be obliterated by an act of terrorism, failed diplomacy, or a simple accident. The film, which includes Jimmy Carter, Mikhail Gorbachev, Pervez Musharraf and Tony Blair, was written and directed by Lucy Walker (Devil's Playground, Blindsight), produced by Lawrence Bender (Inglourious Basterds, An Inconvenient Truth) and developed, financed and executive produced by Participant Media, together with World Security Institute. In his 2002 State of the Union address George W. Bush coined the term "axis of evil" to describe his vision of North Korea, Iraq, and Iran. The US has a new president who has made a fairly big and controversial deal about his willingness to meet with Iran's leaders without preconditions. Iran's last presidential election in 2005 brought the world Mahmoud Ahmadinejad. Another presidential election is coming soon to Iran. 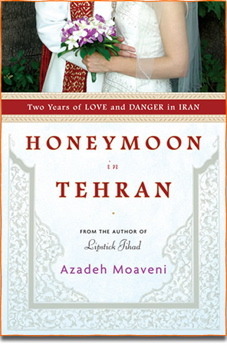 AZADEH MOAVENI has spent a good deal of time in Iran since the year 2000 and written two books about Iranian society. I'll talk with her about life and politics behind the caricatures and rhetoric that so often clouds US perceptions of Iran.